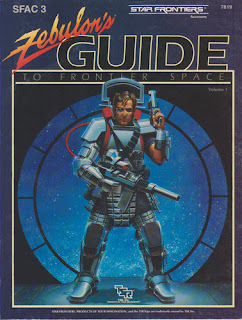 Published in 1985, Zebulon's Guide to Frontier Space appeared just after the period I cover in these weekly retrospective. I decided to include it both because I'm in a very science fictional mode these days (I wonder why?) and because I think Zebulon's Guide offers an interesting example of how fads can affect even game designers. Written by Kim Eastland and Bruce Nesmith, this book was ostensibly a supplement to TSR's science fiction roleplaying game, Star Frontiers. In reality, though, it was in fact a massive overhaul of Star Frontiers, changing nearly every aspect of the game to the point where I consider it a reboot rather than a revision (and certainly not a "streamlined" one, as claimed in the preface). Back in 1985, a mania for color-coded action resolution charts had overtaken the hobby. Numerous games, such as Marvel Super Heroes and Chill, to cite just two with which I was intimately familiar, used such charts and I'm guessing that they proved very popular not just with players but with designers. I say this because it wasn't long before it seemed as if every RPG had action resolution charts of some sort, including some that hadn't originally included them, such as Gamma World and Star Frontiers. Zebulon's Guide was where Star Frontiers made its ill-fated transition to the world of action charts. I say "ill-fated" because Star Frontiers didn't survive the transition. Zebulon's Guide was the last supplement to the game and, while I can't say with any certainty that the rules change was directly responsible for this turn of events, I don't think it helped matters. TSR clearly intended there to be additional support for Star Frontiers, since Zebulon's Guide was released as "Volume 1," but no subsequent volumes ever appeared. In addition to a new universal resolution mechanic, this book introduced classes -- "professions," they were called -- that worked in conjunction with a new skill system. The original Star Frontiers rules were skill-driven, it's true, but they were limited in number and utility, the assumption being that a lot of actions didn't require explicit rules to cover them, leaving their adjudication up to the referee. Zebulon's Guide changed all that by presenting us with skills for nearly everything. The skill list was huge, larger than Traveller's and fast approaching that of Space Opera. I don't necessarily mind lengthy skill lists; they can be appropriate to some games. However, the increase in the number of skills was such an about-face from what we'd seen in the original Star Frontiers that it made it hard to accept that this was somehow the "same" game. Zebulon's Guide also gave us a fifth, optional profession -- the mentalist. The mentalist is a psionicist, using a variety of mental disciplines to achieve his ends. Again, I'm not opposed to psionics, especially in a sci-fi setting, but their introduction here felt "off." The original Star Frontiers gave no hint of the existence of psionics, at least not of the sort described in Zebulon's Guide. So their sudden appearance here, even as an option, further contributed to my sense that TSR was basically starting the game over again, extensively reworking what had come before into a new game. I was already at the time a big fan of Traveller, which was always my go-to RPG for "serious" science fiction; the appearance of Zebulon's Guide made it even less likely that I'd play Star Frontiers, since it meddled too much with the straightforward simplicity that made that game a viable alternative when I was feeling more "wahoo!" about sci-fi. It's a pity, too, because there is some genuinely good stuff in Zebulon's Guide to Frontier Space. I loved the new equipment, the new races, and the expansion of the Frontier setting. But all of these things were lost in my mind because of the massive and unnecessary changes wrought to the rules and general feel of Star Frontiers -- all in the pursuit of the latest fad in game design. It's an object lesson, I think, on a game's staying true to itself regardless of what happens to be popular at the time. There's always room for experimentation and "innovation," but they're best reserved for new games rather than existing ones, a lesson contemporary designers looking to revamp classics of the hobby would do well to bear in mind. I loved this book. It greatly expaned my SF game. I do not think it contributed to the demise of SF, but just TSR policy issuing updates on games they soon cancel. Did they ever do a Volume 2? From the post: "Zebulon's Guide was released as "Volume 1," but no subsequent volumes ever appeared." But I do very much hope that the people to whom that last comment was directed take it to heart. I love color-coded charts games (the Conan from TSR was a very good game), but I felt it ill-used here. I think changing completely a system of a RPG that has already been released with supplements is the RPG equivalent of a death-wish. I put my copy of Zebulon's Guide on sale on ebay in 1995 as I needed the money and couldn't believe the bidding on it. I think I got about $100 for it, back in 1995, when I was just expecting about $10. And it's worth mentioning that it's available as a free (and legal, as far as I'm aware) pdf over at www.starfrontiersman.com. I likes me some innovation. Is it possible that 'Zebulon' was a reference to David 'Zeb' Cook? It's not just possible; it's a certainty. Thanks for that link, J. Block. James, I'm thinking you are a lot like me (and many other gamers) in that you will tire of a certain genre after a time, and move on to doing some Sci Fi, or at least Science Fantasy. You were doing the Dwimmermount sessions around the time I spent two years doing my 1st ed. Night Below campaign. I was so chomping at the bit in the latter half of that campaign (my players were loving it and would not let me take a break) to do something entirely different it drove me to Star Wars (I actually let my players vote on what kind of Sci Fi, and that was the main choice although they aren't Star Wars nuts). Now I'm starting my Call of Cthulhu campaign tonight (at last). I'm hoping Cthulhu, or horror of some kind, is your next stop after your inevitable Thousand Suns campaign (you are putting that together, right?). I should be refreshed and ready for my return to pure D&D fantasy by later this year. Totally agreed on all counts. (Also, the interior art is not good, and Starfleet action in the expanded history timeline contradicts how space combat works in Knight Hawks.) Mentally I think of Zebulon as "Sherman's March to Star Frontiers". I actually liked the original Star Frontiers quite a bit more than Traveller (I actually RAN a three year SF campaign in the eighties, whereas I only ever READ Traveller) but I didn't like this supplement at all and never used it. I really find those action charts to be gratuitous and a waste of time. Let's just roll percentile dice and get on with the game. I have seen a lot of debates on this book at the Star Frontiers Revival forums. Naturally, everyone has been picking apart the rulebooks, supplements, modules and magazine articles to produce a more complete picture for fan-supplements and the Frontiersmen fan-zine, but major discrepancies in the Zebulon book leaves a lot of unanswered questions. Like info on the Rim worlds and the nameless quarantined systems, or the state of the quarantined systems after the cure for the Blue-plaque was found. Where is Rhianna really located? (Outside Gruna Garu or Prenglar?) Are the Mechans bad guys or just neutral? And so on. The common consensus is that info from older materials usually overrides the material from the Zebulon book, but the Zebulon book should not be ruled-out outright, as it has a lot of good ideas but suffers from bad execution. Zebulon's guide introduced a lot of great stuff while overhauling most of the game for no real need. There was an age undreamed of... when TSR sold their games in 9"x12" boxes. D&D, Gamma World, Gang Busters, Top Secret, Boot Hill, and Star Frontiers all came in these boxes. I miss those heady days, not just because of some "rose colored glasses" nostalgia thing, but because that's when games were... well... GAMES. They didn't fit someone's simulation of opinion-based reality. How fecking real is Monopoly or Life? Whatever. On-topic, despite what little worthwhile material there was in Zebulon's, it generally sucked. I'm fairly certain it was the First Sign of the coming TSR Apocalypse (or at least one of the early Signs). Other games came in boxes besides just Life and Monopoly. The 1,000-hour-long The Campaign for North Africa, which requires you to keep track of the supplies needed for each tank and plane in North Africa in WWII came out in 1979. After the Holocaust (1977) includes a Form 1040 and Schedule D to figure out your nation's income every round, and the designer said "...I also wished to illustrate some of the aspects of location theory and its relevance to economic growth in a fluid situation." 1985 was after the death of SPI and the high point of simulationist board gaming, but it hadn't completely faded away yet. Zeb's was released just at the time Gygax would leave TSR and as such it probably suffered a bit. The fad wouldn't slow for a few years yet though and TSR ploughed through. I am rather fond of the thing not as much as a game supplement but simply because a series of running joke involving Humma (Kangaroo Berserkers) and some of there other elements one late night at a restaurant gave me one of the best "friendship" moments of my younger life. Zebulon's Guide is one of my favorite gaming books. I so wanted there to be a follow-up. So much great stuff. I was very excited when I saw the first advertisement for Zebulon's Guide. After purchasing it, I was very disappointed. At the time, I felt it was a death sentence for Star Frontiers. I thought I sensed in TSR a sudden contempt for the game and those who were its fans. That and TSR's abandonment of 1st edition AD&D caused me to never buy another product from that company. mixed feelings on that book--some good new stuff inside, but most of the art sucked, and the rules changes didn't fly with our group. at the time we played both Star Frontiers and Traveller. after this, we dropped the former and Trav became our go-to SF game. I was excited to see this book when it came out but, had mixed feelings afterward. It was inaccurate to market the product as a "Star Frontiers accessory" which was in truth a complete reworking of the game system. I enjoyed the original game for it's simple mechanic and style.